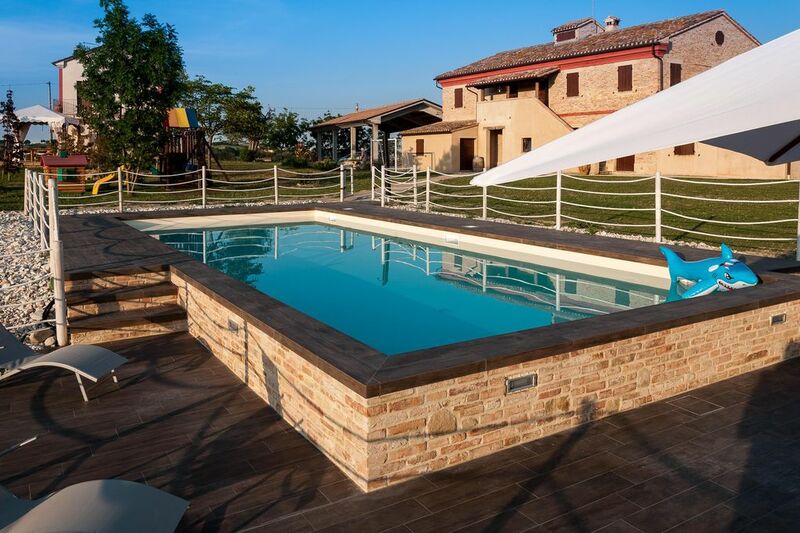 Historic farmhouse restored in accordance with the original architectural lines: it is located in Montale di Arcevia, among verdant hills. You spend a holiday of complete relaxation in an area rich in history, art and nature. Guests are welcomed in a former silkworm processing warehouse in an 18-hectare farm that grows cereals and treats a truffle, a wood and an olive grove; around it there is an area of ​​faunal restocking. From 2013 there is also a swimming pool with umbrellas and deck chairs. The estate is fenced: children can play safely; cars can be left in a covered parking area. We provide bikes for outdoor excursions. In the garden there are wood oven and grill in free use. You are accommodated in 2 studios with kitchen, double bedroom and toilet and 1 large apartment with fireplace: the rooms have private entrances, historic furnishings, garden gazebos. The Bachi da Seta apartment is on the first floor and has a kitchenette / dining room (with dishwasher), a loft on the mezzanine, a double bedroom, a room with 2 bunk beds and another 2 beds in the mezzanine and a bathroom (with washing machine) ). The accommodations have air conditioning / heating, satellite TV, wi-fi, kitchen equipped with fridge / freezer, microwave, kettle, crockery and pots and pans. At 1.5 km there are supermarkets and nearby restaurants with delicious Marche cuisine. Nearby you can visit the historic village of Arcevia with the 9 castles of Avacelli, Castiglioni, Piticchio, Montale, Nidastore, Loretello, San Pietro, Caudino and Palazzo. You can make exits on Mount Catria or Monte San Vicino, one hour away from the Gran Sasso. The sea of ​​Senigallia is only 25 minutes away by car; at half an hour the Conero with the wonderful places of Portonuovo, Sirolo, Numana. Not far from the Frasassi Caves. With short day trips you can get to Recanati, Urbino, Ancona, but also to Assisi, Gubbio, Città di Castello, San Marino, Gradara.